Designated Dawgs was developed at the University of Georgia by a former student, Tim McNary. McNary became aware of the difficulties students in Athens faced in getting home safely after a night out, socializing or studying, in downtown Athens. Bothered by constant stories in the Red & Black about late night assaults, muggings, and drunk driving incidents, he became determined to do something to help the community and his fellow students. In 2000, McNary and his friend, Carl Fleming, began research on how to implement a designated driver program at UGA. Designated Dawgs is modeled after a similar program at Texas A&M called CARPOOL. CARPOOL is the first collegiate safe ride program run solely by student volunteers. Texas A&M alum, Jeff Schiefelbein, developed the concept of CARPOOL when he received a DUI in 1997. After losing his license and doing 60 hours of community service, Schiefelbein was required to appear at a Mothers Against Drunk Driving victim impact panel, at which he heard the story of a woman and her high school daughter’s death as a result of drunk driving. This event inspired him to create the best-designated driving program in the world. McNary and Fleming traveled to College Station to witness the CARPOOL program firsthand. Confident that a similar safe ride program would be successful at UGA, they began to introduce a safe ride program to the Athens community. 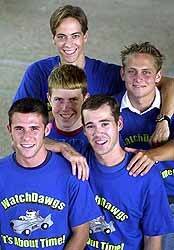 McNary and Fleming chose to name the program WatchDawgs, Inc. After much planning and hard work, WatchDawgs gave its first ride on Jan. 11, 2001. In 2009, the executive board of WatchDawgs voted to change the name of the organization in order to Designated Dawgs, a name which more clearly communicates the services provided by the organization. The Center for Student Organizations at the University of Georgia annually solicits nominations of individuals and student organizations for the Student Organization Achievement and Recognition Awards (S.O.A.R. Awards).